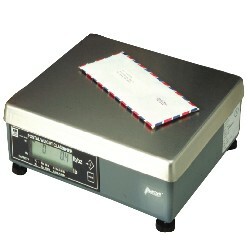 The NCI 7620 parcel and letter scale is suitable for letters, parcels, flats and large packages up to 75kg /150lbs. This versatile counter-top postal scale features a multi-range weight capability, which gives it high resolution and billing accuracy across a wide range of mail. The 7620 bench scale is hard wearing and robust, able to stand up to repeated daily use in a busy postal environment or mail room. It has a die-cast aluminum base and load bridge, with an ABS plastic weighing pan. It is also available with either a stainless steel or a ball top weighing pan for integration into conveyor lines. The 7620 is switchable between lbs and kgs, for added flexibility. This parcel and letter scale can be integrated into existing third party front and back office systems, via an RS232 connection, or RS232 to USB converter. Avery Weigh-Tronix, Inc. is a technology developer and manufacturer of weighing and printing products and systems for customers with rapidly changing needs. For more than 35 years the company has accomplished consistent, strategic growth with the goal of becoming the preeminent supplier of weighing and printing technology for stand-alone and system applications. The high resolution postal weight classifier of choice designed specifically to weigh letters, flats, parcels and larger packages on a single scale. The NCI Model 7620 features a multi-weight range capability to weigh small parcels, as well as, large packages all on one scale with greater accuracy. Accurate and reliable - Quartzell® transducers provide the highest repeatability for consistent weight measurement. Fast Digital Response - The inherent digital signal allows the scale to weigh faster, improving throughput especially in weight ranges that are critical for flats and small parcels. I/O Port – Allows for connection to a computer or a smart terminal. Construction – Stainless steel weigh platter. Painted die-cast aluminum base. Die Cast Load Bridge – Reduces overall scale deflection. High Resolution Mode – Mail and parcels can now be weighed on a single NTEP certified scale, even sensitive international mail, with multi-range weighing. Units Switching – Switch between decimal pounds and pounds/ounces, decimal pounds and kilograms, or pounds/ounces and kilograms. Protocols – Standard NCI, emulates Detecto and Mettler-Toledo. Ball-Top Weigh Platter – Simplifies transport of all parcels. Ideal for conveyor lines. Remote Display – 7 digit LCD housed in a molded plastic enclosure with a 7-ft. (2 m) cable. Display Post – 12” (30.5 cm) post for remote display. 10' RS-232 Interface Cable (9 Pin to 9 Pin) included with each scale.